Unlike most networks, the ABC has to be cautious when a star journalist emerges among its ranks. Unsurprisingly, it's all about playing politics. 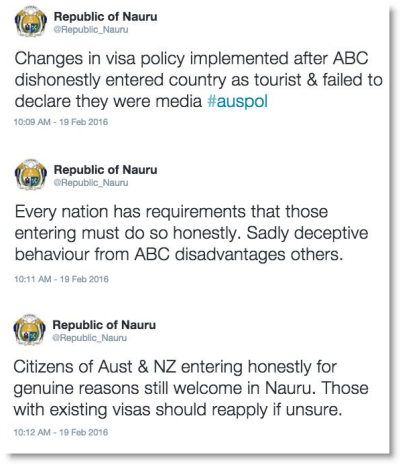 The Republic of Nauru said it had changed its visa policy because the ABC had "dishonestly entered the country as a tourist". But the ABC says no ABC journo did any such thing. Crikey journalists Josh Taylor and Myriam Robin report. The ABC is considering a radical shake-up of its news and current affairs departments, along the lines of a largely untested British model which has been described as a "churnalism sweatshop". Highly regarded journalist Paul Lockyer, pilot Gary Ticehurst and cameraman John Bean, all who had been with the ABC for decades, had been working on stories about Lake Eyre for the ABC when their helicopter went down.